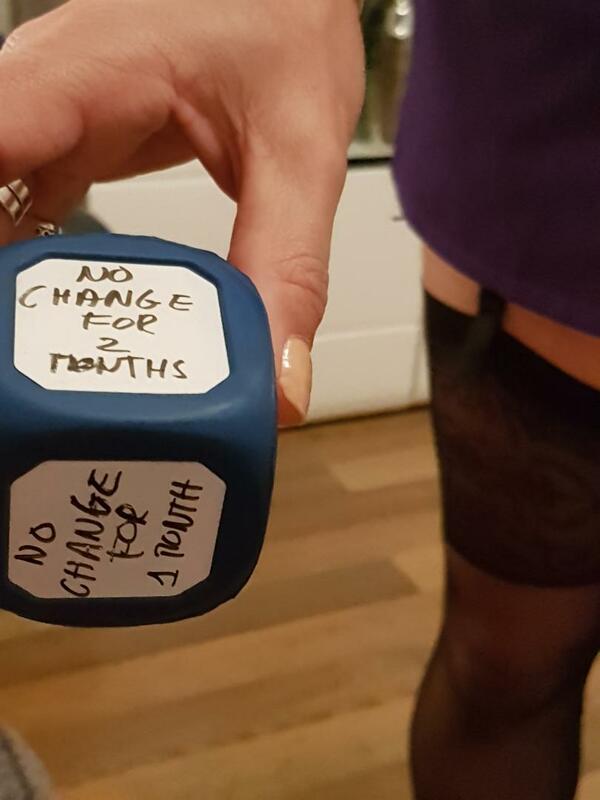 First off i am excited to report that tonight i was returned to chastity and, what's more the chastity dice determined that i will be locked up for at least two months. The dice will be rolled again on the 11th March. Today, Owner also came up with another suggestion for the dice. It is a special dice that Owner can write on and so can constantly change the instructions on each face. Now whenever i work from home i am always expected to text Owner and enquire whether She has particular 'instructions' for me. Sometimes She asks that i be plugged and such like. She has even instructed me to go into the street with humiliating signs attached to me. Anyway, today She advised that She will also start using the dice as a means of giving me 'activities' to perform whilst i am working from home. i am very excited at what might lay in store. In fact, talking of working from home, i think i surprised our downstairs neighbour earlier this week. It was actually one of my days off, Owner was at work, and i was dressed in a short skirt, stockings, bra, blouse and slippers when the doorbell rang. Thinking it likely a delivery i bounded down the stairs only to be surprised to discover it was our neighbour wanting to ask me something. It was too late to try and make any attempt to conceal my outfit and the only option was to brazen it out and chat to her. She seemed somewhat surprised by my appearance but said nothing and it wasn't long before i was updating Owner about my unexpected encounter! Mind you, that was as nothing compared to the outfit i was wearing working from home today for 'dress down Friday', and of course we received two deliveries in the mail so the delivery people had a surprise too. Luckily this time there was no encounter with our neighbour. Honestly, i am such an exhibitionist! If i may be impertinent and ask a question i was wondering what method you use to be clean body shaven? If rude then don't answer and apologies but your body looks so smooth. Hi sissysteph - many thanks for the comment. To be honest, the pictures i post are a manifestation of the exhibitionist in me, it's a risk i am aware of. i don't think of myself as being at all brave, it's just somethign i love to do. When exactly is your birthday? i ask as mine is on the 16th of this month and it would be lovely if to know if we shared the same date. It will be my big 49, one more and i turn 50! Oh god! Let me know how you get on with your learning with Goddess. Owner has devised an additional dice idea that i think Goddess might enjoy. i will post about shortly. Thank you sissysteph, it was lovely.